Travel More. Live More. Be More. | Thank you for finding me and following me on the Internet. be in balance is now Inspired Quests. I invite you to check out Inspired Quests and hope you will choose to follow my new blog. Please note: be in balance will cease to publish and will be removed soon. As navigators of spectacular vacation experiences, Expedia® cruiseshipcenters® is your vacation expert and I am here to ensure the perfect vacation for you. Contact me for more details. Click here to join my 7SEAS® Club. As a member, you can subscribe to my newsletters and receive exclusive deals, destination information, and travel news sent directly to your inbox, based on your personal interests. You will love the award-winning newsletters! I respect your privacy and will not sell your email address to anyone and you can opt-out at any time. most on-board dining, entertainment, and activities. Exclusive deals and sales, no spam guarantee, and the chance to win a FREE cruise vacation for two. Join my 7SEAS® Club today! Expedia® cruiseshipcenters® brings together the power of Expedia® Inc and the strength of CruiseShipCenters® which means I can offer you the best value on the widest selection of cruise and land vacations. 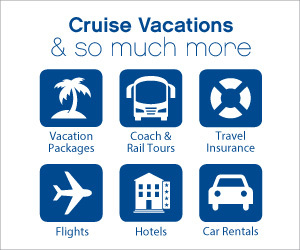 Please do not hesitate to contact me if you have a question or would like to book an Expedia® cruiseshipcenters® vacation.